New Orleans Saints tight end Jimmy Graham said he hopes the league reverses the rule that prohibits dunking the football over the crossbar of the goal post. 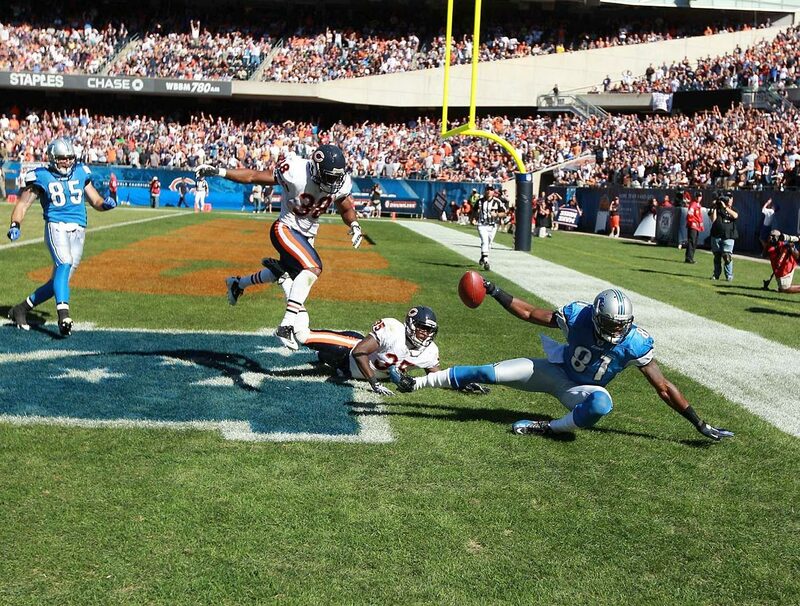 The NFL banned the action last year and said those who dunked the ball would be penalized for the celebration. In a 2013 Thursday night game against the Atlanta Falcons, Graham bent the goalpost at the Georgia Dome after one of his scores, causing a brief delay as workers came in to straighten the bar. Graham also dunked the ball twice in the preseason, drawing 15-yard penalties for unsportsmanlike contact for “using the ball as a prop” and receiving $30,000 worth of fines. Graham scored twice during Sunday’s Pro Bowl and dunked after each score. He was not penalized for either celebration. Graham finished the game with three catches for 30 yards. The league ruled in 2003 that long hair is an extension of the uniform, and thus it's OK to grab it to make a tackle. 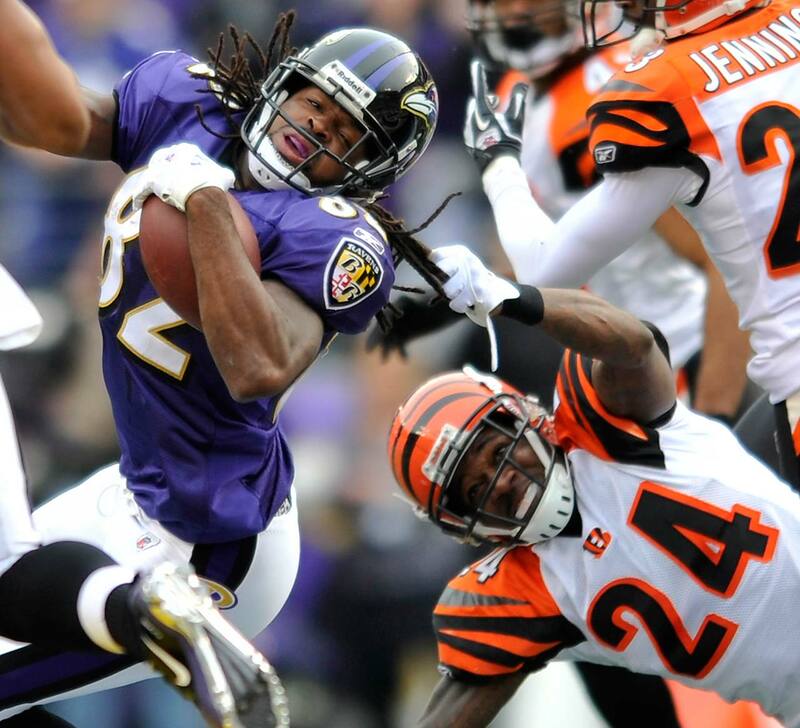 Torrey Smith learned that lesson the hard way when Adam Jones yanked Smith's hair during a 2011 game. Here are some other rules closely associated with players and coaches. 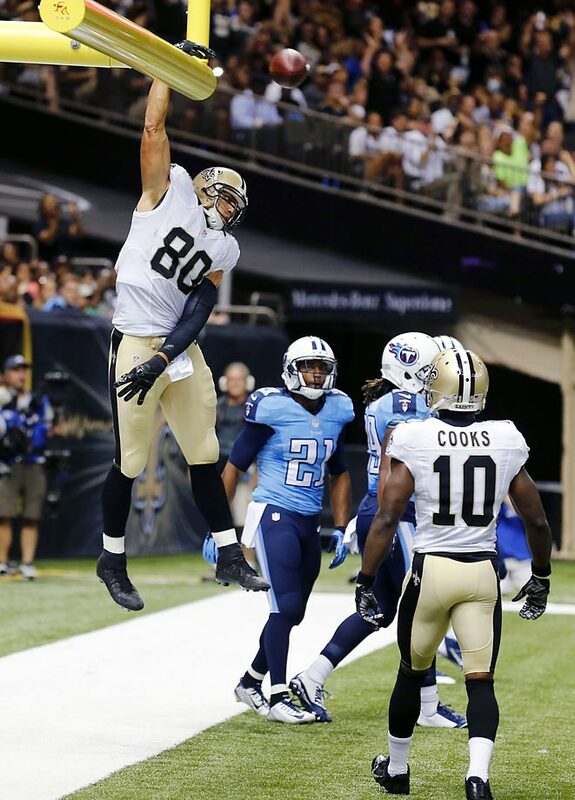 New Orleans Saints tight end Jimmy Graham had been celebrating touchdowns for years by showing off his jumping and dunking ability, but the NFL outlawed it heading into the 2014 season. Graham defied the NFL poobahs by dunking not once, but twice, during a preseason game shortly after the rule went into effect. He stopped soon thereafter, thanks to a $30,000 fine. The NaVorro Bowman rule allows video reviews on plays with a recovery of a loose ball on the field, even though the play may have been whistled dead. In Bowman's case, he clearly stripped and recovered this ball on a 3rd-and-goal play in the 2013 NFL Championship game. 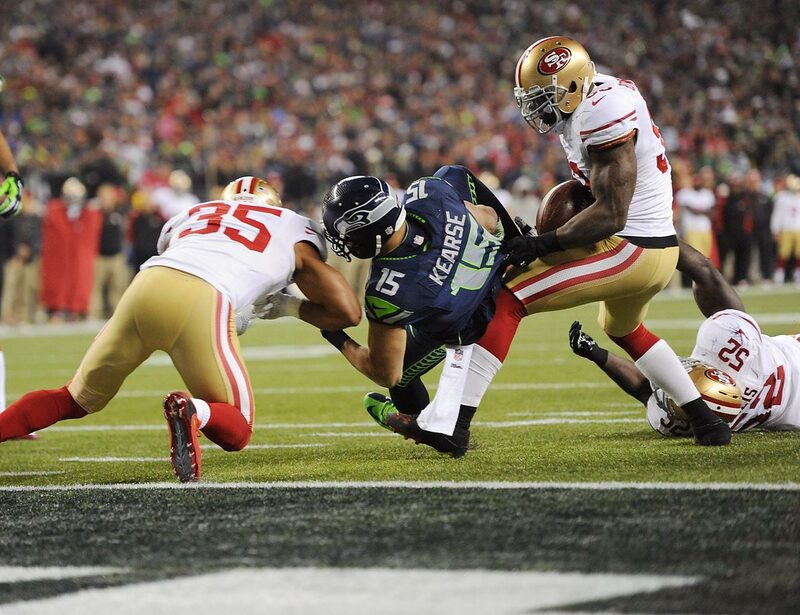 However, an official ruled that Jermaine Kearse maintained possession. Under the old rules, the play couldn't be reviewed or overturned. A receiver must maintain possession of the football throughout the completion of the play. In Calvin Johnson's case, the ball moved enough when he hit the ground that officials ruled he hadn't maintained possession. A rushing defender is prohibited from forcibly hitting in the knee area or below a passer who has one or both feet on the ground, even if the initial contact is above the knee. It is not a foul if the defender is blocked (or fouled) into the passer and has no opportunity to avoid him. The rule came after Carson Palmer and other quarterbacks suffered knee injuries due to low hits. Players cannot grab the inside collar of the back or the side of the shoulder pads or jersey pads or jersey, and pull the runner toward the ground. 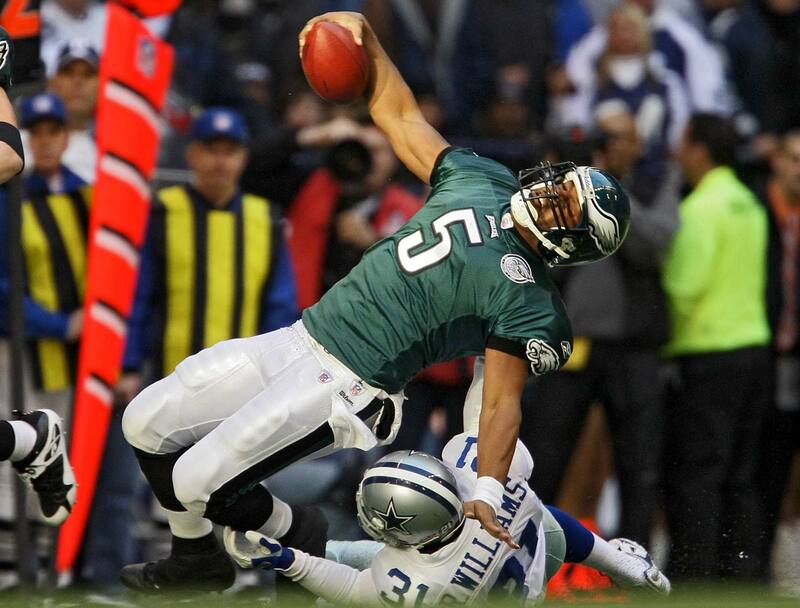 Roy Williams (pictured here tackling Donovan McNabb) inspired the rule after Terrell Owens suffered a broken ankle and Musa Smith a broken leg after horse-collar tackles by the Dallas defender. It's an unsportsmanlike conduct penalty for a player to remove his helmet in the field of play or the end zone during a celebration or demonstration, or during a confrontation with a game official or any other player. 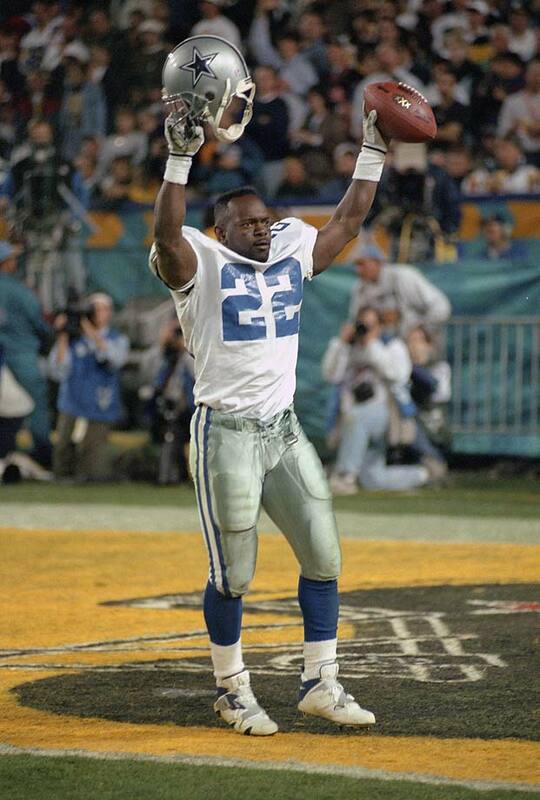 Emmitt Smith had a penchant for doing as much after he scored a TD. 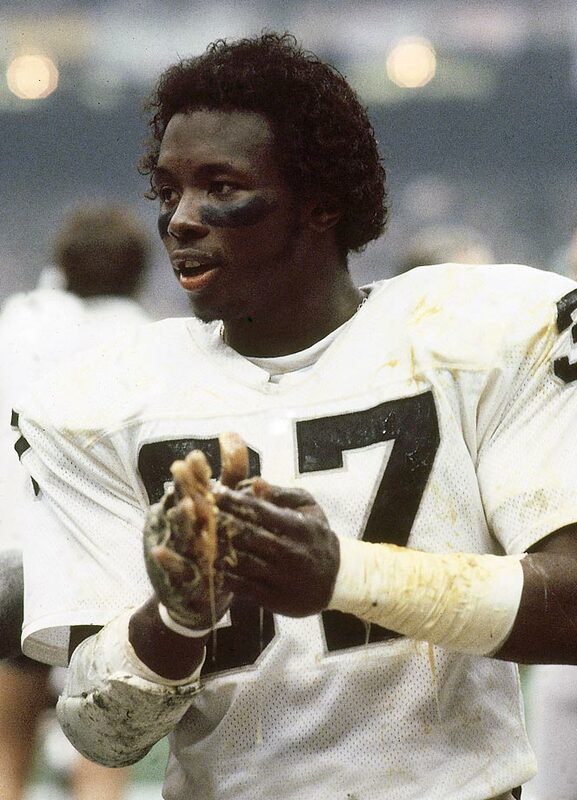 Lester Hayes used so much Stickum on his hands in the late '70s and early '80s that the NFL banned sticky substances in 1981. 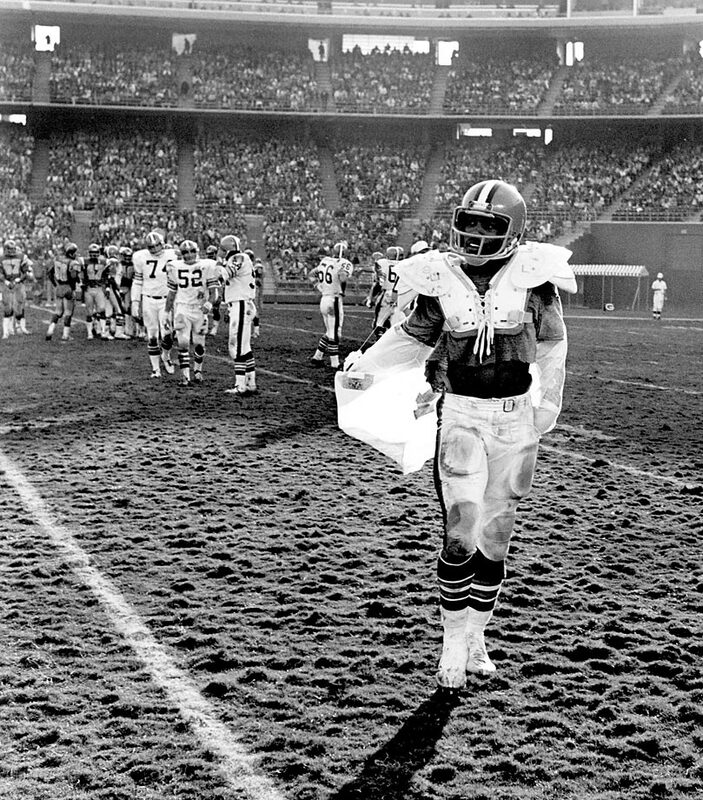 The league banned tear-away jerseys in 1979, putting an end to Greg Pruitt's efforts to escape tacklers by wearing easily ripped jerseys. If a quarterback loses possession of a ball while bringing it forward in a passing motion, it is considered an incomplete pass. 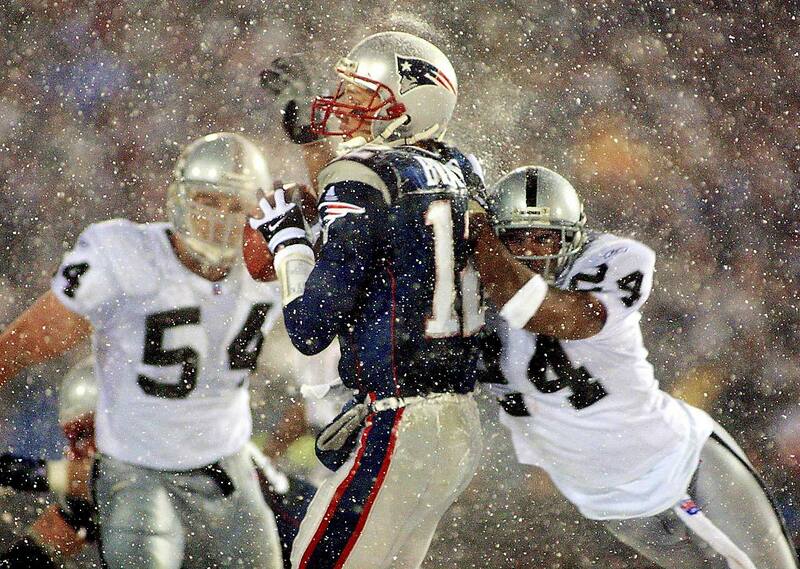 The Tuck Rule extended that to circumstances wherein "the player loses possession of the ball as he is attempting to tuck it back toward his body." The rule became infamous in the 2001 AFC divisional playoff game between the Patriots and the Raiders, when Tom Brady appeared to fumble the ball after being hit by Charles Woodson with under two minutes left. The fumble ruling was overturned, and the Patriots went on to with the game in overtime. The rule was eliminated in 2013 by a 29-1 vote. 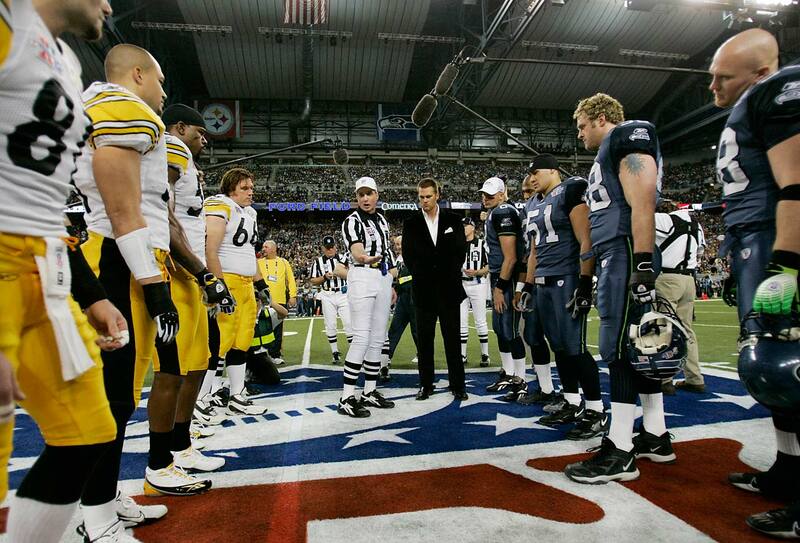 Prior to the referee’s coin toss, the call of “heads” or “tails” must be made by the captain of the visiting team, or by the captain designated by the referee if there is no home team. This one came about when, on the midfield coin flip before overtime in a Thanksgiving Day game between the Steelers and Lions, Pittsburgh running back Jerome Bettis called tails. Referee Phil Luckett told pool reporters after the game Bettis had called ''heads-tails'' and Luckett went with the first thing he heard. The Steelers kicked off and never saw the ball again in the 19-16 loss. The Steelers were the only team to vote against the rule that makes it a penalty if a blocker uses his helmet, forearm or shoulder to hit a defender from behind or from the side. 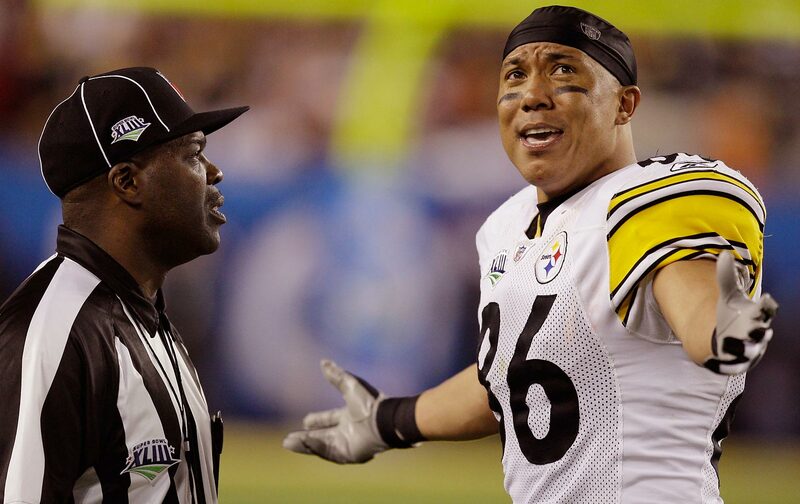 Hines Ward broke the jaw of Cincinnati linebacker Keith Rivers while making such a hit in 2008. 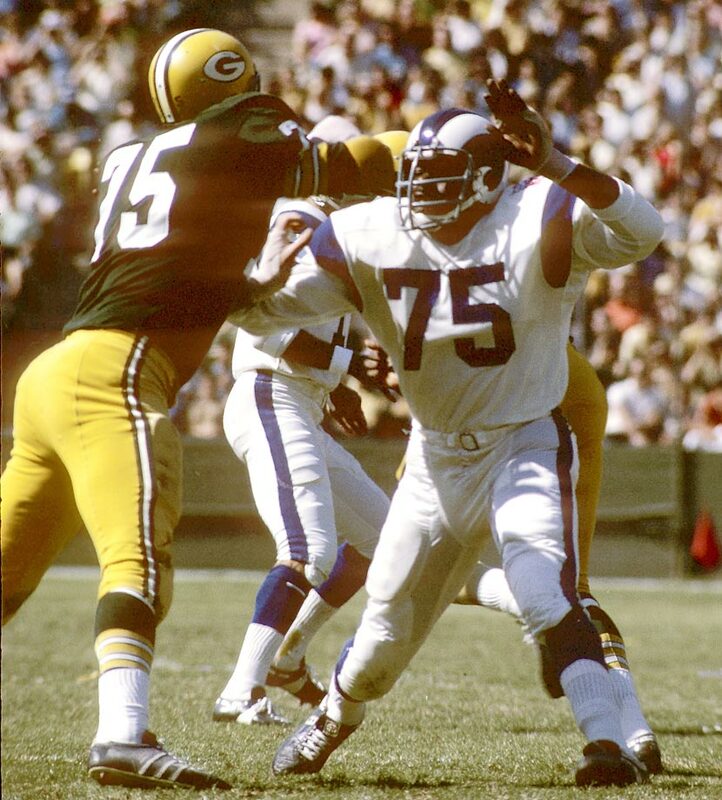 The NFL banned Deacon Jones' favorite weapon, the head slap, in 1977. 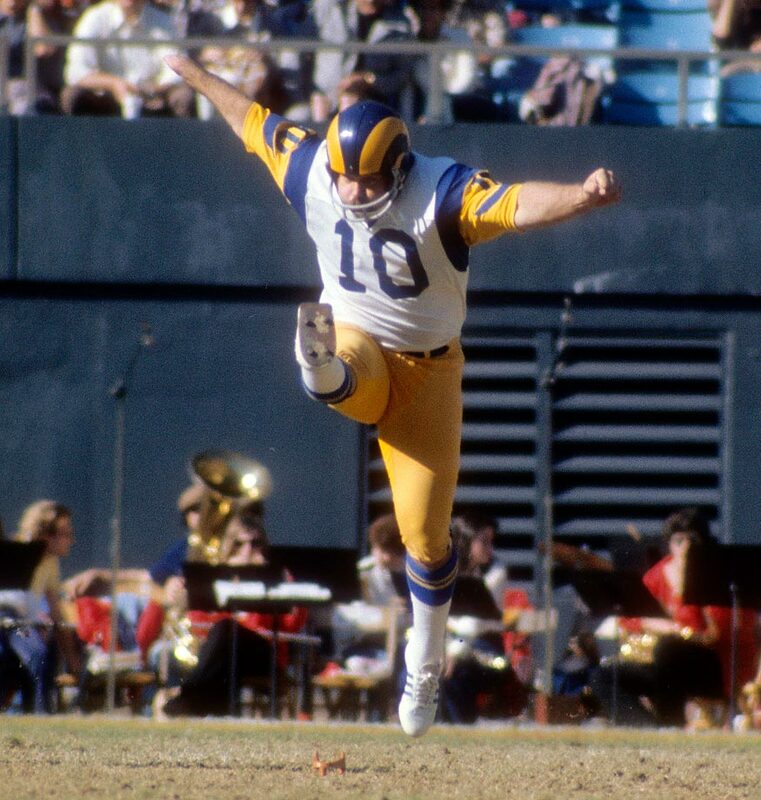 Named after the New Orleans Saints kicker who was born without toes on his right foot, the Tom Dempsey rule states that the kicking surface of a shoe worn by a player with an artificial limb on his kicking foot must conform to that of a normal kicking shoe. Dempsey wore a modified shoe throughout his career and kicked a record-setting 63-yard field goal. Under the old rules, if a coach throws a challenge flag on an automatically reviewed scoring play, he receives an unsportsmanlike conduct penalty and the review is negated. 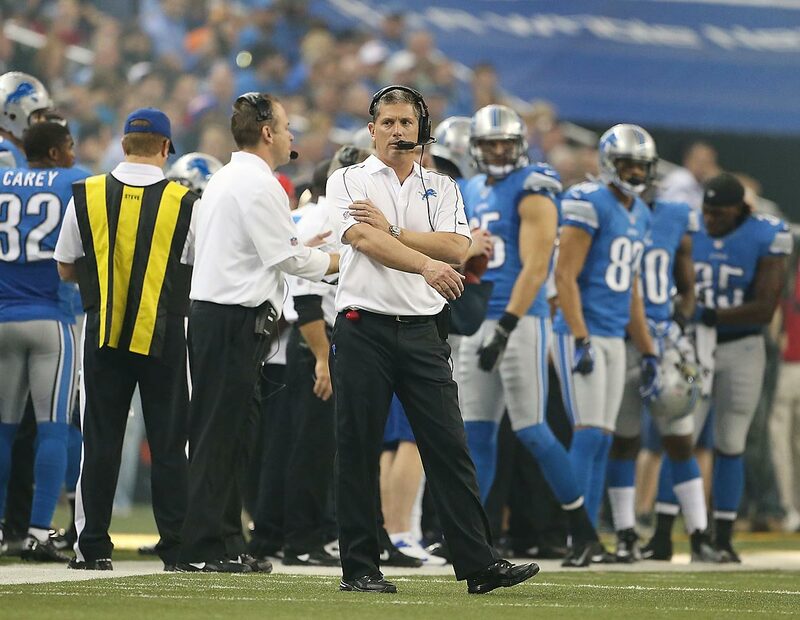 Jim Schwartz became a victim of the rule in the 2012 Thanksgiving Day game against the Texans, when he threw the flag after Justin Forsett ran for an 81-yard touchdown despite being down by contact. The rule change allows automatically reviewed plays to still be reviewed even if a challenge flag is mistakenly thrown. With the Phil Dawson Rule, field goals and extra point attempts that hit the uprights or crossbars are reviewable. The rule came after Dawson's 51-yard field goal against the Ravens with only seconds remaining was declared no good. Following a period of confusion, the officials then reversed the call after discussing, not reviewing, the play. Any contact with a receiver beyond five yards from the line of scrimmage is prohibited. Ty Law and the Patriots spurred the league to crack down on the act after New England was deemed to have been overly physical with the Indianapolis Colts in the 2003 AFC Championship game. The ball can hit the ground and be considered a reception as long as the receiver maintains control of the ball. 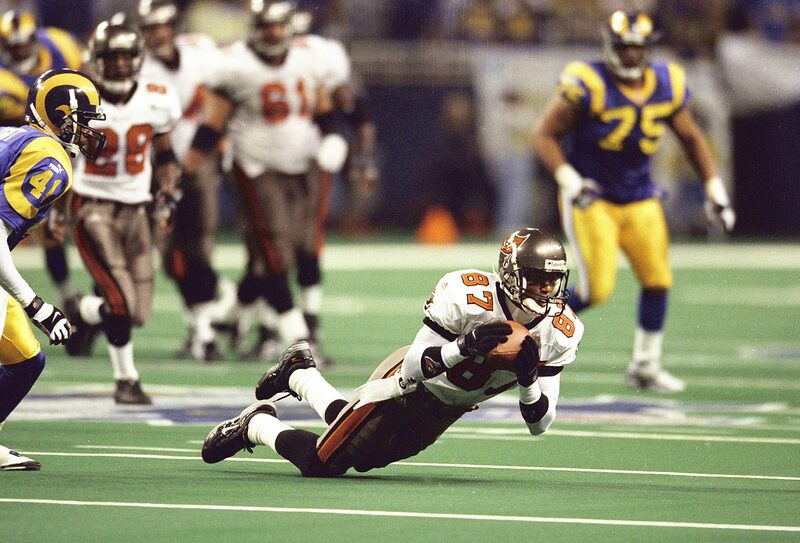 In the 1999 NFC Championship, Bert Emanuel's pass was ruled incomplete for touching the ground, and the Bucs lost the game two plays later. The controversial call prompted the NFL to enact the rule in the following season. 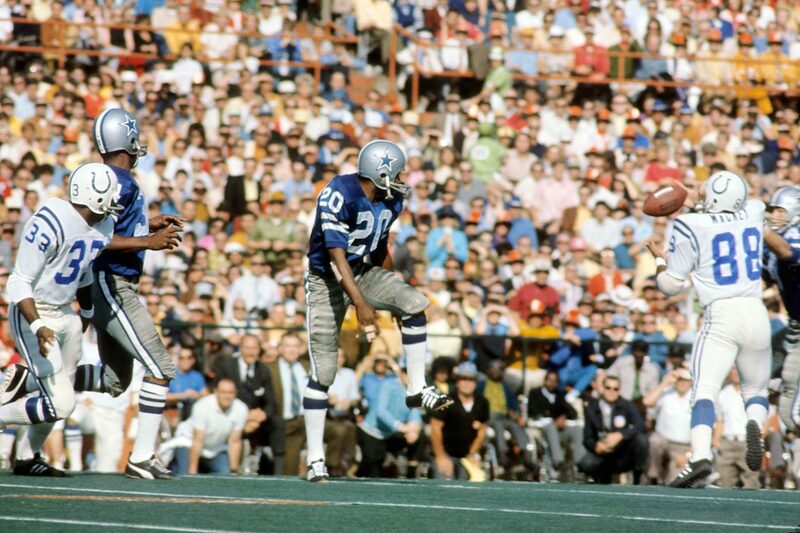 During Super Bowl V, Cowboys defensive back Mel Renfro tipped a pass that was then caught by the Colts' John Mackey, who ran it for a touchdown. Back then, a deflected pass could only be caught by a second offensive player if it was first touched by a defensive player. This was also the rule in question during the famous "Immaculate Reception" play. The rule was finally changed in 1978 to allow for double touches by the offense and dubbed the Mel Renfro rule. In 2008, NFL owners passed a proposal that allowed a defensive player to wear a speaker in his helmet to communicate with the sidelines instead of using hand signals. 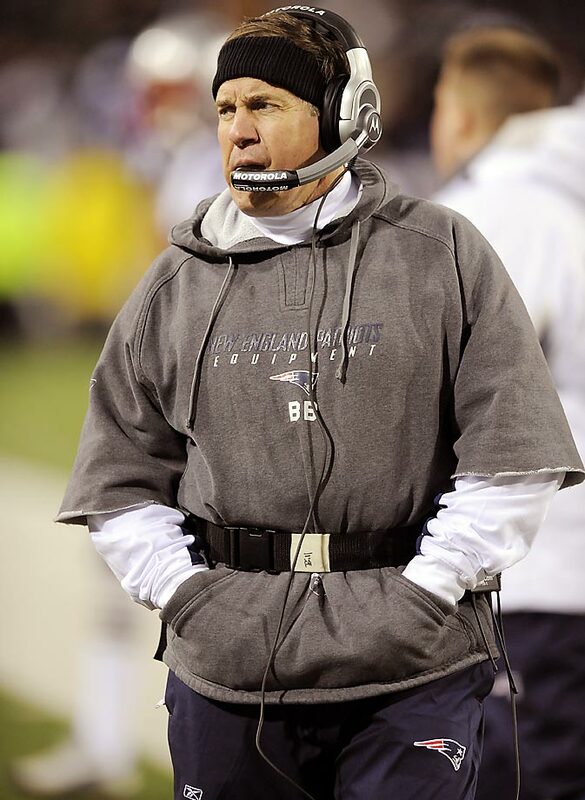 The proposal came after "Spygate," when Bill Belichick and the New England Patriots were fined for secretly videotaping a New York Jets practice to learn their defensive signals. The rule, named after former Buffalo Bills gunner Steve Tasker, states that gunners who intentionally run out of bounds receive a 15-yard unsportsmanlike conduct penalty, which is why guys like Derek Hagan (pictured) fight so hard to get past blockers while inbounds. Any fumble that occurs in the final two minutes of each half or on fourth down can only be advanced by the offensive player who fumbled the pass. 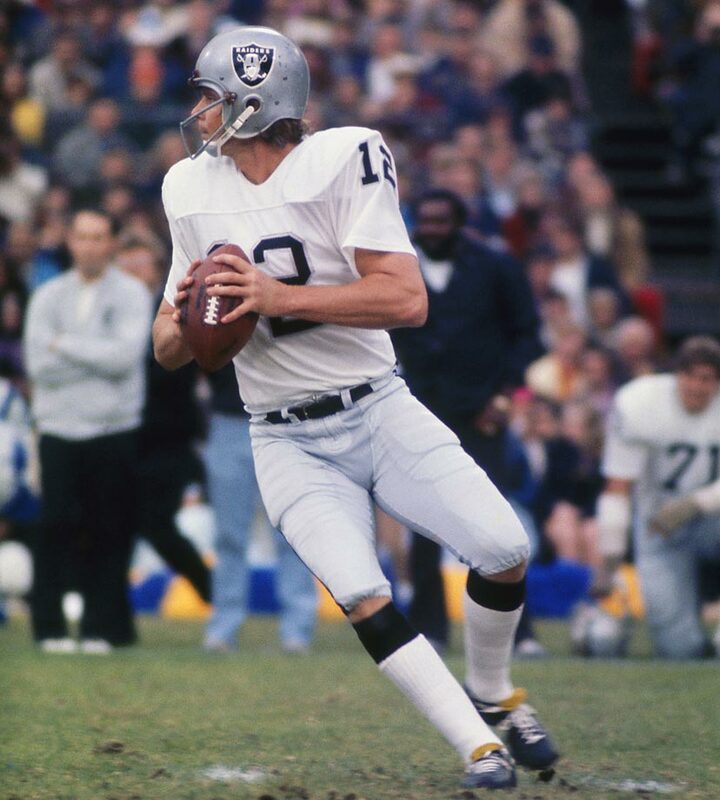 The rule came after the "Holly Roller" play, where Raiders quarterback Ken Stabler's deliberate forward fumble of the ball with 10 seconds left in the game led to the victory over the Chargers. The NFL banned the use of any artificial aids to assist in a kick in 1956. 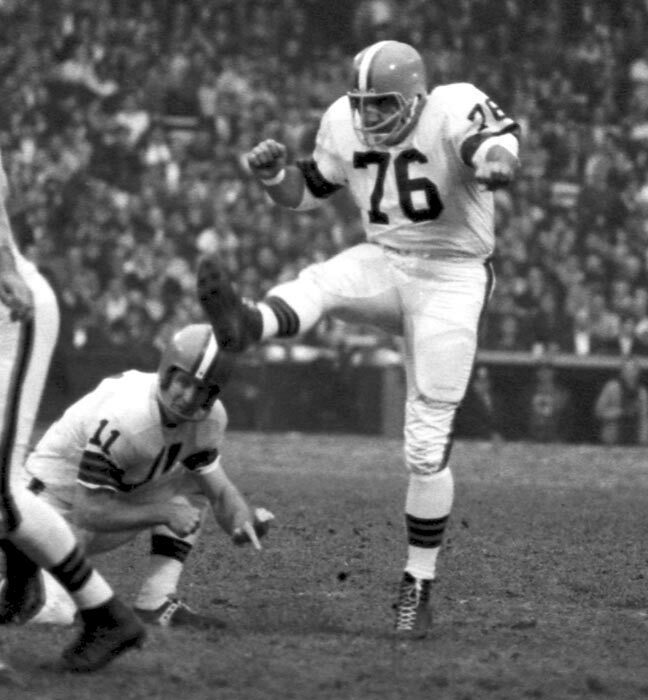 Lou Groza would use a 72-inch piece of tape to line up his kicks toward the center of the goalposts. 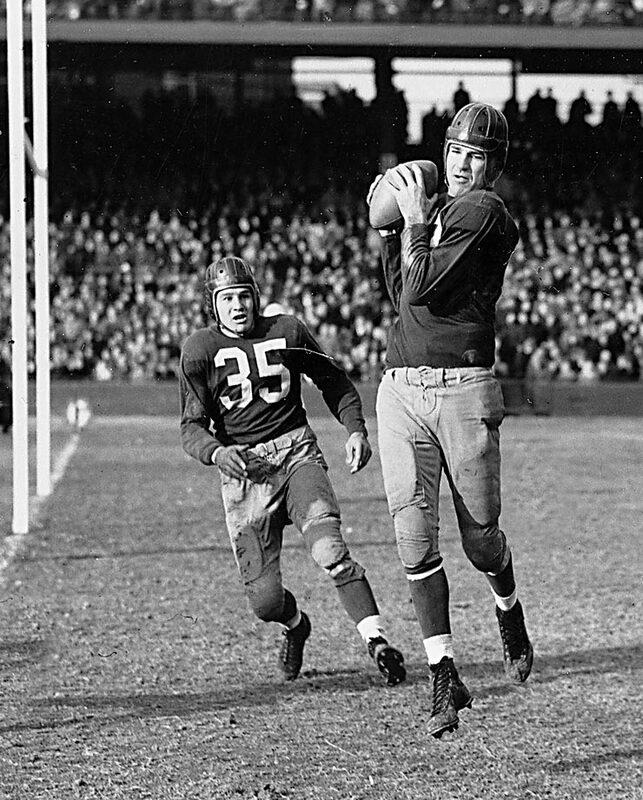 Sammy Baugh helped to pass a rule in 1946 stating that forward passes which hit the goalposts are ruled incomplete. During the NFL Championship game the previous year, Baugh and the Redskins lost after the Rams scored a safety off Baugh's pass that hit the goalpost. 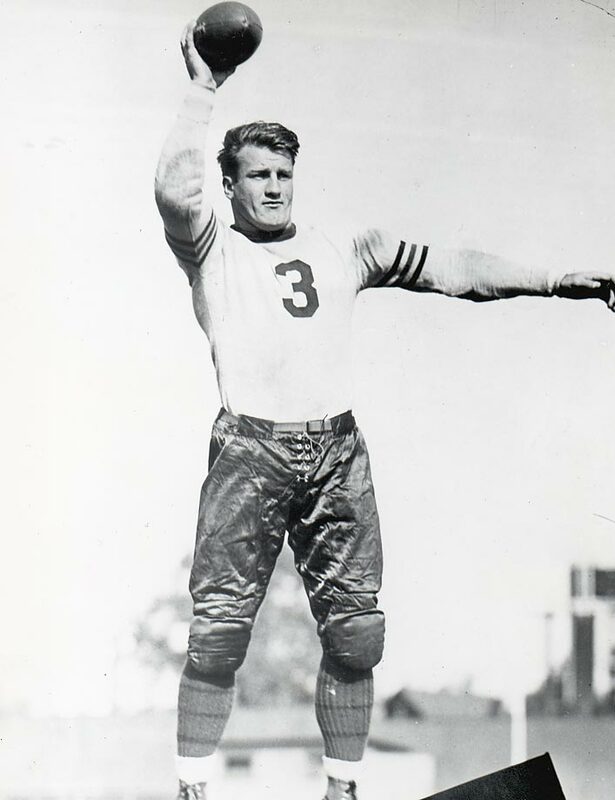 Chicago Bear Bronko Nagurski's game-winning touchdown pass in the 1932 NFL Championship game was disputed by the opposing Portsmouth Spartans, who insisted Nagurski did not make the pass at least five yards behind the line of scrimmage, as was the rule in 1932. The following season, the NFL changed the rules to allow forward passes anywhere behind the line of scrimmage.